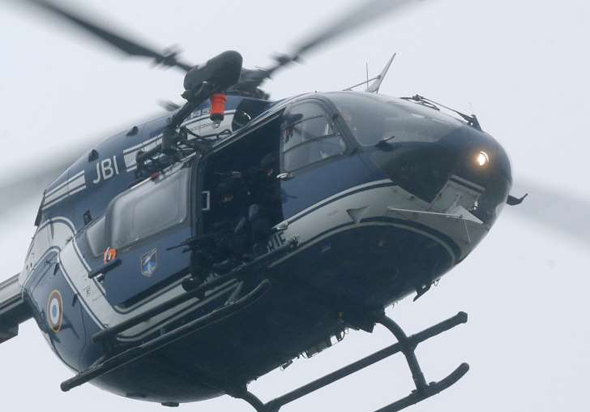 A gunman has seized hostages at a kosher supermarket in Paris as police in northern France have cornered the two Charlie Hebdo massacre suspects. 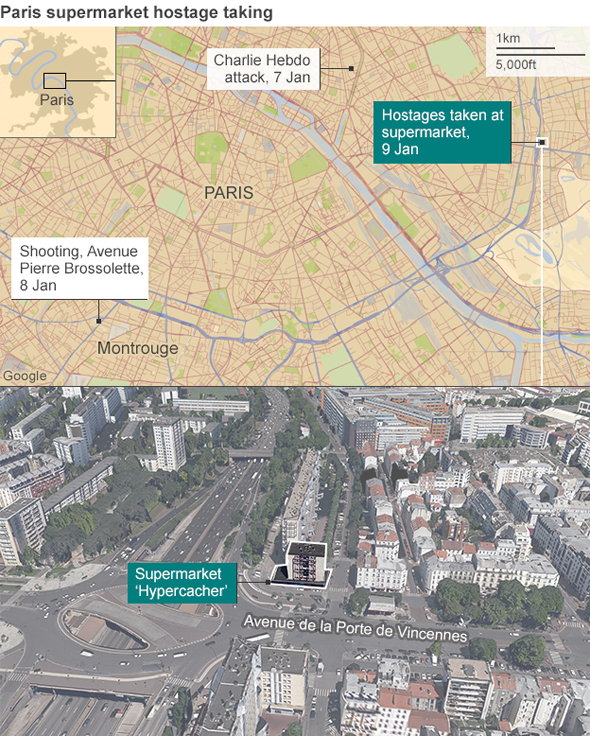 A police officer told the BBC that two people were killed after a gunman believed to be the killer of a policewoman in Montrouge entered the supermarket near Porte de Vincennes. Armed police have flooded the area. 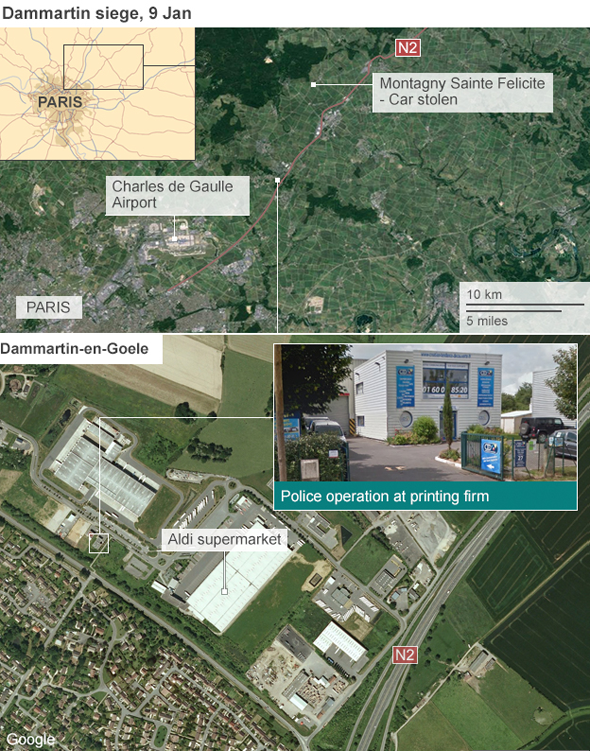 In Dammartin-en-Goele, 35km (22 miles) north-east of Paris, the Charlie Hebdo suspects are also holding a hostage. 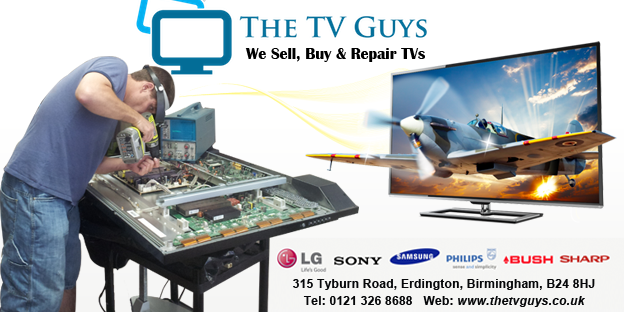 The Islamist militants are inside a small printing business and have reportedly said they are prepared to die. 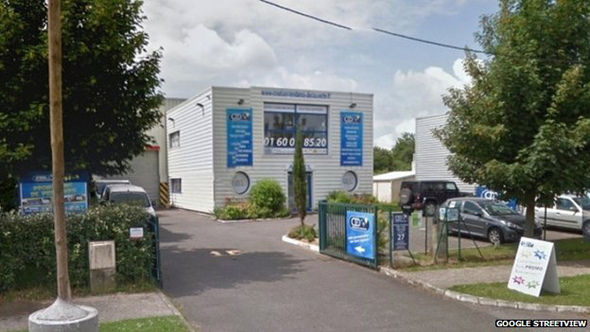 Twelve people were shot dead and 11 were injured in Thursday's attack on the office of Charlie Hebdo, a satirical magazine which freely mocks religion. 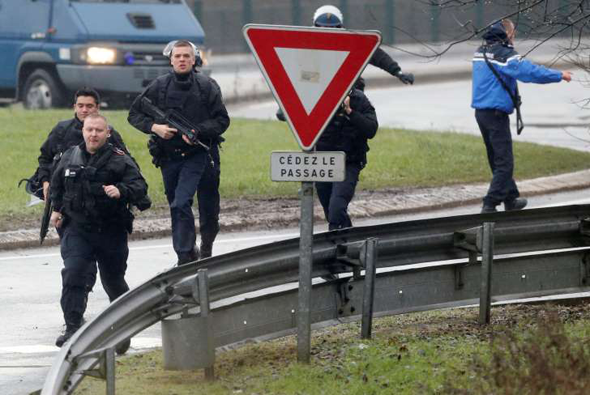 Heavily armed Swat teams mobilised in Paris. 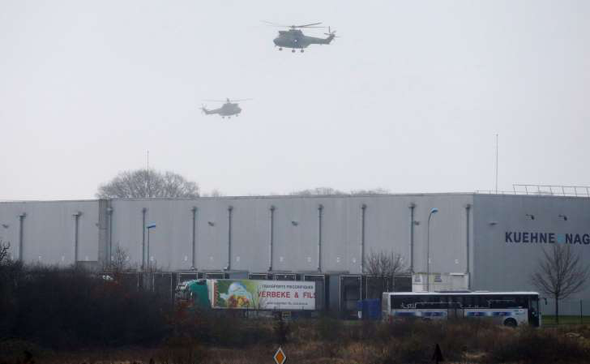 The hostage-taker in eastern Paris - said to have taken up to five people prisoner - knew at least one of the suspected Charlie Hebdo attackers, a source told AFP news agency. The gunman is suspected to be behind the shooting of a policewoman in Montrouge on Thursday. 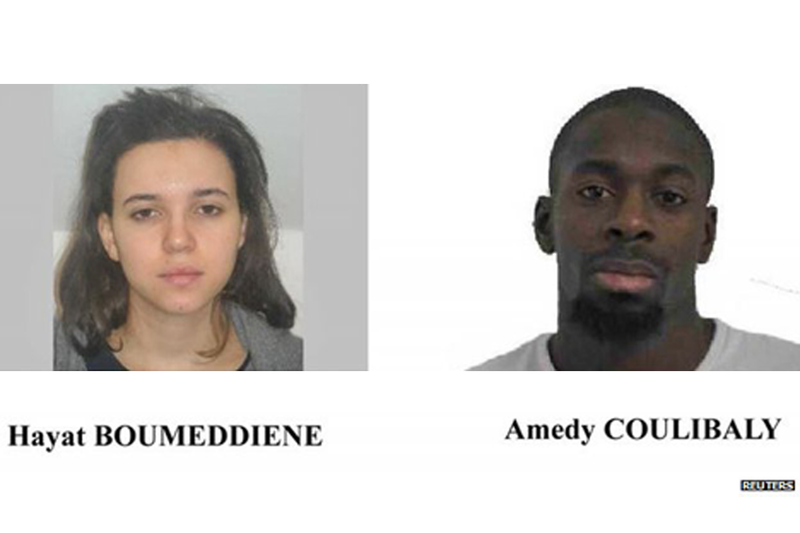 The two were thought to be "armed and dangerous", French police said. 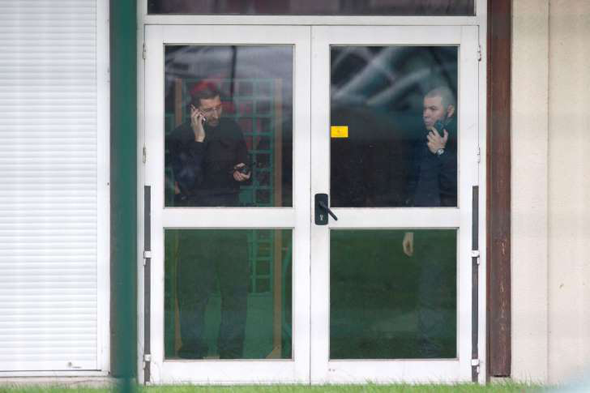 The Charlie Hebdo attackers, named as two brothers linked by intelligence officials to militant groups, shouted Islamist slogans during the shooting at the magazine office on Wednesday and then fled Paris in a hijacked car, heading north. The car's owner is said to have recognised them as brothers Cherif and Said Kouachi, the key suspects. 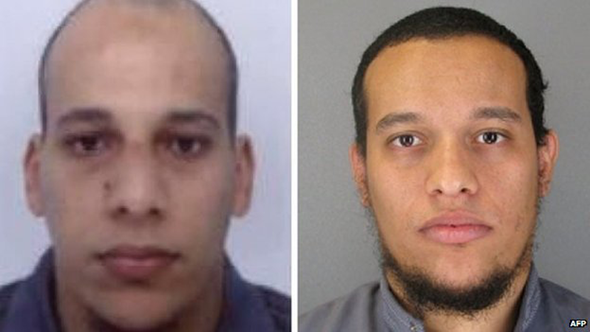 In a televised statement, Interior Minister Bernard Cazeneuve confirmed the men being sought on Friday were those wanted for the Charlie Hebdo attack and said they would be "neutralised". The suspects have been surrounded in a small printing business named CTD, a source close to the investigation told AFP. An interior ministry official said there had been no deaths or injuries on Friday, despite earlier media reports. "We heard shots and we returned very fast because everyone was afraid," she told French broadcaster iTele. "We had orders to turn off the lights and not approach the windows." The security situation has affected flights at the main airport in Paris, which is in the vicinity. Officials at Paris Charles de Gaulle say they have changed landing and take-off patterns for aircraft in the light of the security situation. It is believed the Charlie Hebdo gunmen were angered by the satirical magazine's irreverent depictions of the Prophet Muhammad. During the attack on Charlie Hebdo, the attackers are said to have shouted "We are al-Qaeda, Yemen", an apparent reference to the al-Qaeda in the Arabian Peninsula group (AQAP). In the US, a senior official has told reporters that one of the two brothers alleged to have carried out the attack, Said Kouachi, spent "a few months" training in Yemen with the group. Said and his younger brother, convicted terrorist Cherif Kouachi, were on a US no-fly list before the attack, a US counter-terrorism official told the New York Times. France's main Muslim federations have called on imams at 2,300 French mosques to "condemn the violence and the terrorism with maximum firmness". French President Francois Hollande has appealed to citizens for tolerance, saying France had been "struck directly in the heart of its capital, in a place where the spirit of liberty and thus of resistance breathed freely". The lawyer for Charlie Hebdo, Richard Malka, has said that next week's edition of the magazine will go ahead on Wednesday and will have a print run of one million instead of the normal 60,000 copies. One of the magazine's surviving cartoonists, Luz, attended an editorial meeting on Friday with staff from liberal French daily Liberation. He was not at the magazine's offices on Wednesday at the time of the attack.